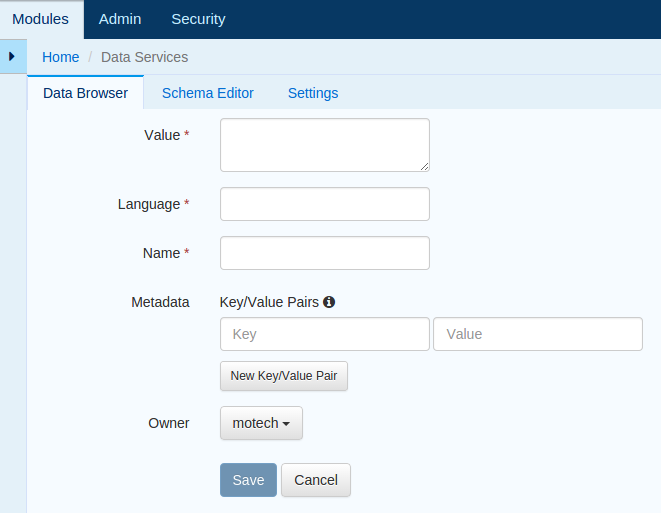 As of MOTECH 0.25, it is now possible to bulk import MDS entity instances in CSV format. This short tutorial describes the process. For this tutorial, we’ll use the CMS Lite module, which has a simple data model and represents a real-world use case where bulk upload is useful. First let’s take a look at CMS Lite in the data browser, in particular the StringContent entity. StringContent has four user-supplied fields: value, language, name, and metadata (a key-value map). The former three fields are required. Note that it’s not necessary to set many of the entity’s fields in your CSV file (e.g. owner, creationDate, createdBy, modifiedBy, etc. ); these will be set by the system. If you include the id field and it matches an existing entity’s ID, the import will be handled as an update to the existing row.